I went in to see Thalia around noon. I was able to coax her onto the stump near the front door with a piece of chick. Once her appetite was whetted, she was eager to come to me. The first pounce on my gloved hand was pure bliss. I watched her slender, long legs dance as her fierce talons gripped my fingers hard. She bent down to tear at the meat with her beak. Now I could absorb the scene rather than worry about how it looked to bystanders. I carried her to a perch with fluid steps as she picked the glove clean, asked her to step onto the perch, and returned to my post in the open corner of the mews. We danced, moving and flying from different perches to avoid routine. I wanted every moment, every pounce to be fresh. She chirped a few times in excitement over the tasty activity. It was all I could do to take in her features through the blur of hunger. Once I finished feeding Thalia the meal I’d prepared, I stood by the door for a while to bask in her presence. She stood quietly on her perch, her crop bulging with food, and set to preening her lovely coat. The mixture of colors in each feather was exposed as she chose one and then another to zip into place. She roused (shook her entire coat) and a shock wave of release coursed through my body. Instantly aware of herself, she turned her head to look me in the eye. It was as if to say, “Who is this strange woman in my company today?” I felt her legs and wings tense just before she leapt to a perch inches from my shoulder. I held my breath. She released her firm grip on the perch and went back to preening. I exhaled. Her feathers relaxed across the contours of her frame and she cocked her head to meet my gaze. My steady breath was all that broke the silence. The maiden harrier subtly lifted the foot furthest from me while curling it in a loose ball. Her ebony talons disappeared into the thick down on her belly. She was far from the anxious hawk I’d seen pulling feathers from her legs. Likewise, I was miles from the frightened woman trapped on an island. Here stood our window to salvation. Our next month of training was plagued with paradox. The times I spent alone with Thalia in her mews were serene, heavenly hours. This is where I fell hopelessly in love with this harrier’s unbound spirit. She was at once confident, aggressive, and friendly. I worked tenaciously to gain fluidity and strength in my raptor handling skills while she patiently walked me through the process. Even the simple task of accommodating the weight of this one-pound hawk on my outstretched hand could not be taken for granted. My shoulder and arm ached for weeks. I had so much to learn. I could only use five fingers to manipulate her leather ankle jesses through a swivel and onto a leash. It was just like knitting one-handed—the highly tuned muscles in each of my fingers could only remember the motion through repetition. Thalia allowed me to train my right hand over and over. She would often use the time to pick any hint of meat she’d missed off the glove. The days I met with either Annie or Sandra for training outside the mews varied from hopeful to nerve-wracking. Both women were superior teachers and lovingly supportive. Not for a moment would I ever fault their skills at falconry or at coaching, but regardless of our best efforts Thalia easily slipped into distress. My first attempts to have Thalia step to my glove from a perch outside ended in her flapping wildly at the end of her leash. Sandra was able to work with Thalia and the perch with no incident. Annie diligently walked me through the process on our next outing and Thalia was perfectly calm. Another day, Annie and I had tried everything we could do to get Thalia to step on the scale. To the hawk it was a leg hold trap and there was no way to convince her otherwise. After the struggle over the scale ended, I was able to stand with Thalia resting quietly on my glove while Annie and I talked. 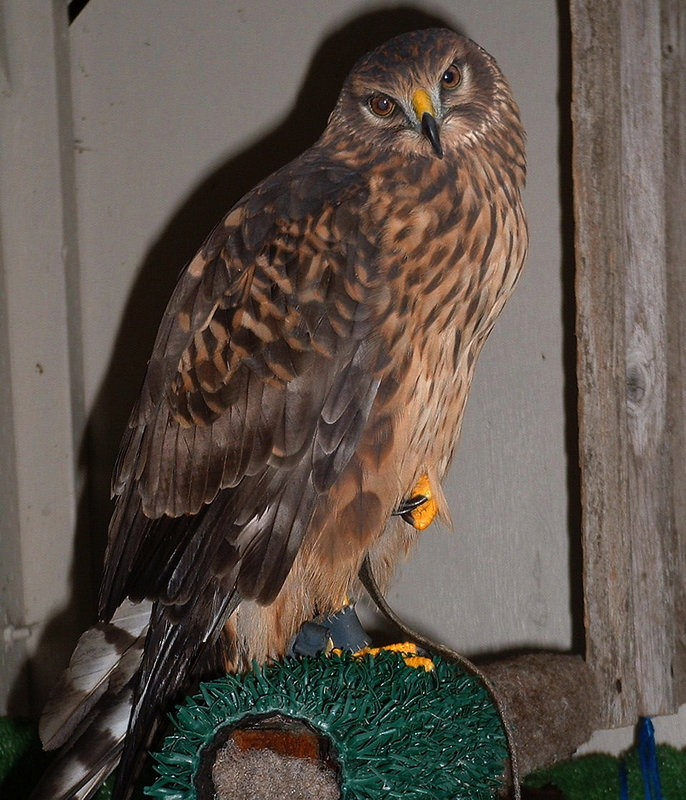 During walks to and from the raptor barn, Thalia would waver from patience to panic. Sometimes the five-minute walk took twenty because we had to stop and wait for her to settle every time she jumped or looked like she would jump. When the wind was unnerving Thalia, Sandra suggested I face her into the wind. For five minutes, this worked fabulously. Thalia roused and was pleased, but then she took back to crouching and holding her wings out—both clear signs of anxiety. Encounters with strange people or dogs also stressed her, but the worst was when we had to grab her, wrap her in a towel, and do health checkups and maintenance. I did my best to hold steady, but the fight or flight response coursing through Thalia’s veins automatically raced through mine. Secretly, I wondered if it was my fear that Thalia was picking up on or vice versa. Regardless, I found very quickly that whatever emotion moved through the hawk also moved through me, often in a physical sensation. Her releasing rouses shook tension from my body. Her panicked body posture froze fear in my muscles. The swings between comfort and fright were severe. Through my experiences with Thalia I was accessing layers of joy and fear I never knew existed in my being. The moments of joy were exhilarating and the flashes of fear were paralyzing. I wasn’t sure if Thalia’s anxiety was inextricably linked with mine or if it was coming from those around us. I yearned to walk the grounds of Willow Brook alone with her to unwind the mystery. I went on a shamanic journey to lower world and met a wolf that led me through the maze of dead-end paths in the dense forest that I had been wandering for years. The paths were worn to dirt from all of my pacing. This time the wolf led me to a grassy path that led out of the dense brush and into an open, old growth coniferous forest. There were no more choices to make along this path—just the squish of soft grass under our feet. Then everything went black and I knew that I was at a point where the landscape was going to be different. First I saw dapples of light and then deciduous trees. Then a whole different forest of shorter trees with an open understory came into focus. It was autumn and the trees were ablaze with red and orange. The wolf disappeared and the fawn, my life purpose animal, was with me. As we talked, I learned that this was a metaphor for where I currently was in my life. I turned around 360 degrees and was surrounded by the colors. The fawn suggested that I paint a picture of what it looked like to me. A blank canvas stood on an easel below an oak tree. It was clear that this place was where all my options were. There was no clear path on the ground. I talked to her about how frightening fall was for me. It was cold, the sun was far away, and the end of the year was near. “All of these things could bode poorly,” I voiced. Then an image of a great gray owl swooping down onto an untracked field of snow came into focus. The owl reached out its massive feathered feet, dug them into the snow, pulled out a mouse in her talons, and silently slipped away. I understood then that I needed to find a space clear of fear to paint an unbiased picture of where I was and, thus, where I was going.